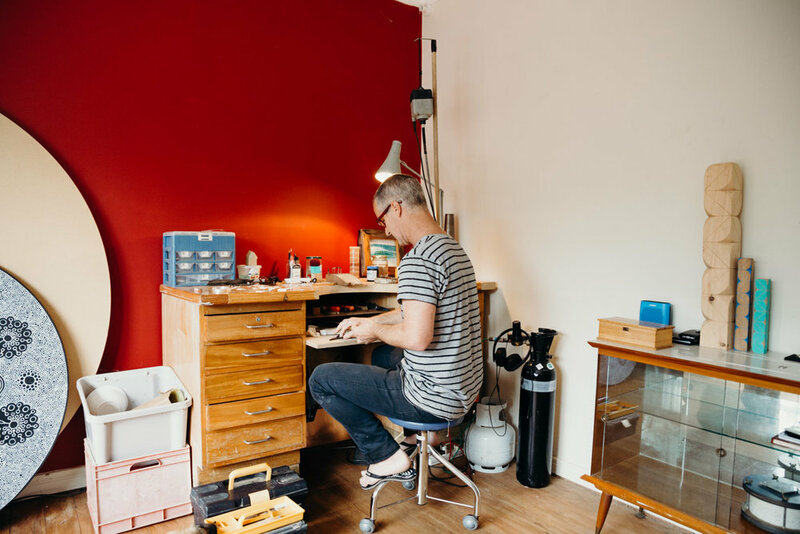 I studied jewellery design and manufacturing in the early 90’s in South Africa and that’s where I found my passion for design – working with metals and pattern. I came to New Zealand in the early 2000’s and worked for a jeweller on K’Road in Auckland which was great for honing my craft. 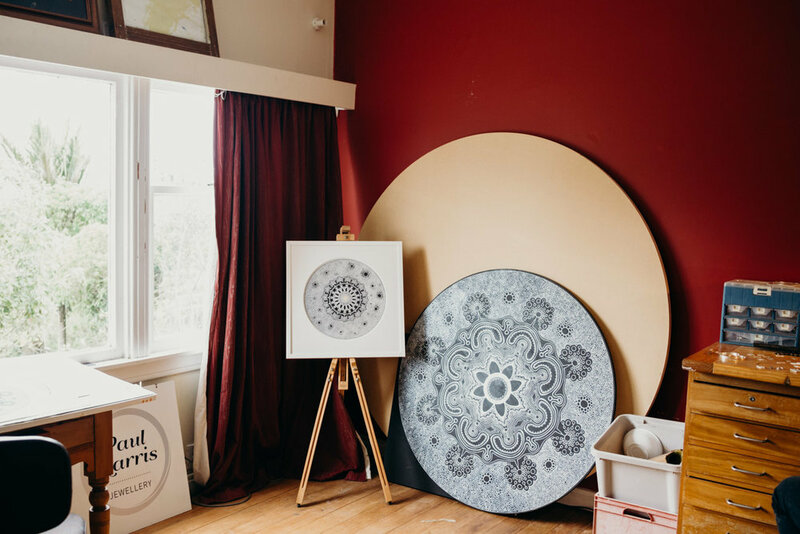 In 2003 I opened a studio at Corban’s Art Estate, and that’s where I began to make my own designs and my exploration of pattern really began. I used the techniques I had available to me and I started exploring repetitive pattern on to metal mostly through saw work and then later, through the use of wire. I saw metal as a canvas for those patterns to appear. 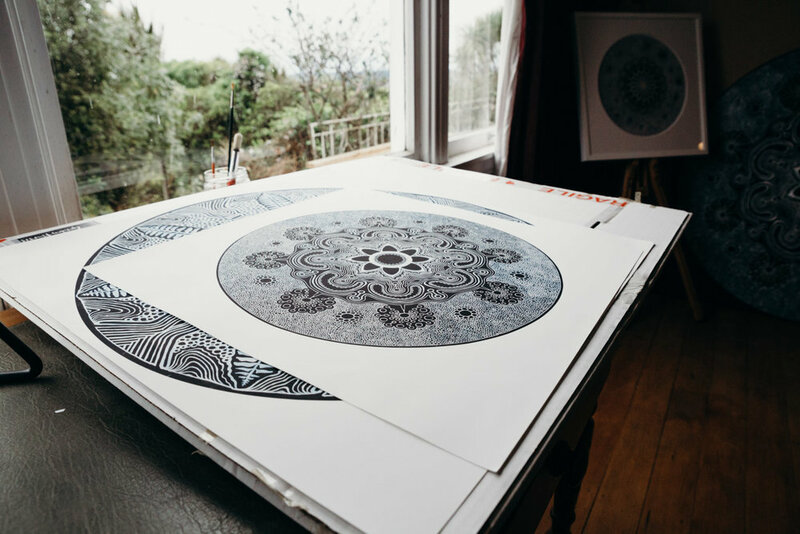 The designs and complexity grew as my techniques grew, which coincided with my work being shown in a growing number of galleries. After the birth of my first daughter I took some time to focus on family. Now that the kids are older I have the time and space to refind my passion. 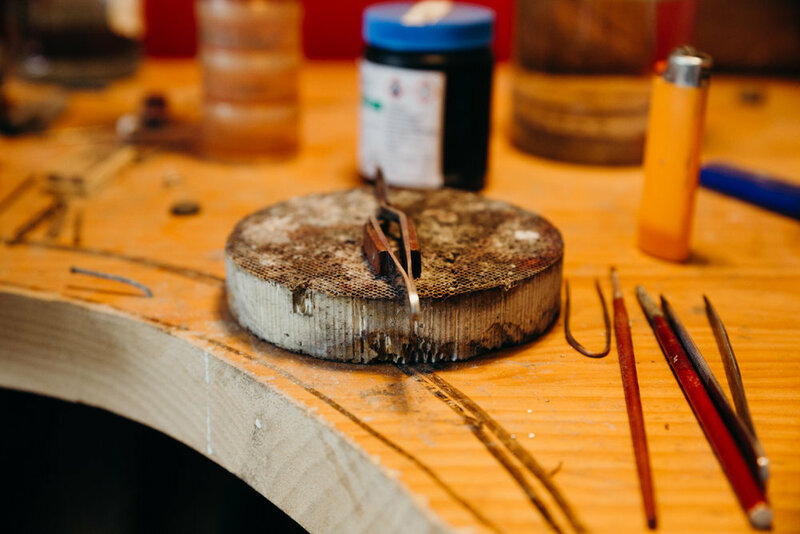 When I first started, I worked mostly with my saw making pendants and sawn earrings, which I seem to have gone back to lately. Following that I started to use other elements like ceramic, stone, and shell, which I combined with my love of pattern. This satisfied my enjoyment of recycling elements, and expressed my ideas around what’s precious to people. If something is found or holds meaning for somebody, that to me, is more precious than the usual precious things like diamonds and gems. So I’ve enjoyed incorporating those into my jewellery. Over the last five years I’ve reignited my passion for painting, and this has really enhanced my jewellery work. They’ve grown side by side and have reinforced my love of pattern and then reinforced the work in metal, and now in native timbers as well. I work from my home studio up behind Waitakere Village. I really love working from home and having that freedom. I love living where we live because it seems to be that perfect blend of country living, city life and everything the West Coast beaches offer. I’m a small town guy, but really enjoy that I get to step into the city life when ever I want because it’s so close, but I don’t have to live in it. We get to see the city lights and enjoy them from afar, but really it’s the green of the west I love. And I’ve learnt to love the constantly changing weather. I like that we can get crazy hot summer weather, and crazy rain and crazy winds all in the same day sometimes. They will see a working studio. 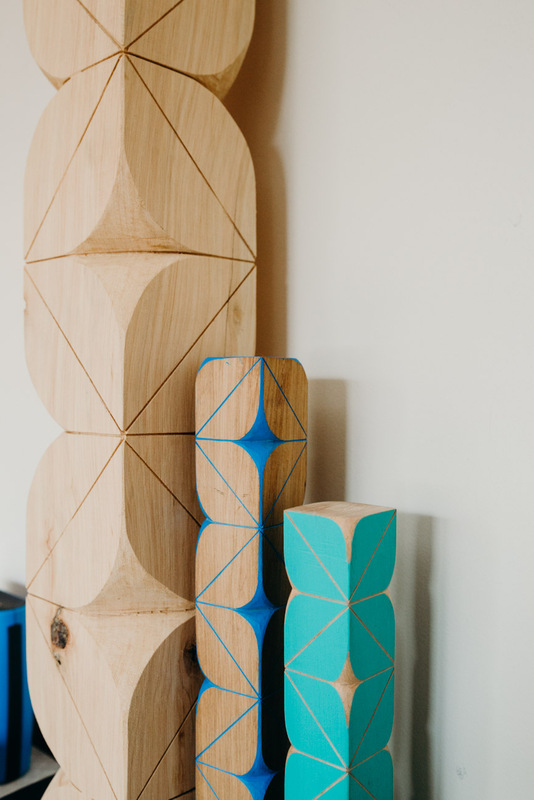 I’ll have a mix of finished work and work in progress – jewellery, painting and some of the latest wooden carving work that I’ve been adding to the pattern range. I will be in the process of working on a new body of work for the galleries. I’m really happy to answer questions about any of the work and really enjoy talking with people about it and learning more about their stories. I’ll also have work for sale and lots of stock on display, painting, carving and jewellery. So they’ll get to see a bit of everything. 1 – Looking out across the waves and back to the beach from my surf board, when it’s a good off-shore day at Muriwai or Piha. 2 – The look out up at the top of Scenic Drive which looks out over the city. This was a refuge of mine when I live in Piha and a place of getting perspective. 3 – Our back garden. We’re lucky with the view we have, but down in the garden you’re also hugged by the trees and bush that we back on to. 4 – The view from our room. From bed get to see the most magnificent sunrises that come up over the city and Rangitoto. We’re pretty lucky where we are, and the view from bed is uninterrupted. 5 – The last is not a panoramic scenic view but I love it anyway, the home vege garden. With the mix of sunshine and rain we get the garden is almost always cranking.